"Dr. melissa and her staff listened to me answered all my questions." One of our team members will compile your medical and dental history during your first visit. We will then examine your teeth and gums, screen you for oral cancer, take X-rays of your teeth as needed and complete a TMJ (temporomandibular or jaw joint) exam. After we review your dental profile, we will discuss a diagnosis with you. If treatment such as a root canal (endodontics), braces (orthodontics) or oral surgery is needed, we will plan to treat you in our office or refer you to a specialist. We will discuss your options for treatment and fee payment and help you determine the best plan to fit your needs. During regular follow-up visits, we will examine your teeth and gums, screen you for oral cancer, clean your teeth and make plans for treatment as needed. We will discuss any pain or problems you may be experiencing and answer any questions you may have. Please call our office as soon as you determine that you have a dental emergency. We will be glad to work you into our schedule if you have a dental emergency during regular business hours. After hours, over the weekend and during holidays, please call our office for Dr. Melissa's emergency contact number. How long is this going to take, and how many times will I have to come back? We are dedicated to providing you with comprehensive care. Therefore, we allow sample time to give you the best possible outcome. We know how valuable your time is, so we work to accommodate your schedule. Generally, we can do as much or as little work as you want per appointment. How soon can I eat after my appointment? After getting numb, we advise patients to eat only soft, cool foods until the numbing wears-off. This helps to protect your mouth. Although it varies from person to person, the numbness usually wears off within 3 hours. We offer a product called OraVerse to reverse the numbness. It is a wonderful way to return to your daily activities sooner. Please ask us about this today. I hate the dentist, how is your office different? Nobody likes going to the dentist, including us. This is why Dr. Jarrell designed a new dental office, where going to the dentist is (believe-it-or-not) a pleasure! With treatment rooms featuring nitrous oxide (laughing gas), flat screen televisions, headphones and microbead pillows, this is not your father's dental office. Our patients feel pampered each time they visit us. Come see for yourself. What if a patient uses a seeing-eye dog? Do they have the right to bring the animal into your office? Yes. We are also wheelchair accessible. Does Dr. Jarrell treat children? Yes! We love having children in our practice. We welcome all patients from age 1 to 102. Read more about our services for kids by clicking here. We encourage you to bring your child to the dentist at age 1 for a well-baby visit. What does "painless dentistry" mean? Painless dentistry is a means of ensuring your total experience in our office is as stress-free and pain-free as possible. We will discuss treatment options that may require no local anesthetic and whenever possible, alleviate pain by the means most comfortable to you. Should I help my children brush their teeth? Yes, your children likely need help until they are around age 7 or can tie their shoes by themselves. It is very important to brush at least 2 times per day and before bedtime is the most important time to brush. Receive a 5% prepayment courtesy (restrictions apply - ask our office for details) by paying in full at time of service. For services requiring multiple appointments, our financial coordinator will work out a financial agreement that fits your needs. We accept most major credit cards including MasterCard, Visa and Discover. We accept these cards to allow you the most convenience in taking care of your account. As a service to our patients, Family & Cosmetic Dentistry of Kokomo, PC offers electronic claims processing. We work with your insurance company to provide the most accurate estimate of your co-pays with the information they provide. Only the estimated patient balance is due at time of service. We offer a yearly Preventive Care Plan for unlimited preventive treatments for one low fixed price for patients that do not have dental insurance. This helps make dental needs affordable and also includes 20% off additional treatment. Once the initial plan is started there are NO COPAYS. The preventive care package will cover many procedures that are extremely beneficial to the prevention of disease and dental caries that may not be covered by normal dental insurance. Ask us today for more information on this great opportunity. We have made arrangements with the CareCredit company to provide payment plans. This allows you to complete your dental work without delay and make relatively small monthly payments. You can apply on-line from our website. Senior patients over 65 years of age without dental insurance receive a 5% senior courtesy. We offer a 5% courtesy to all active duty and active reserve patients. 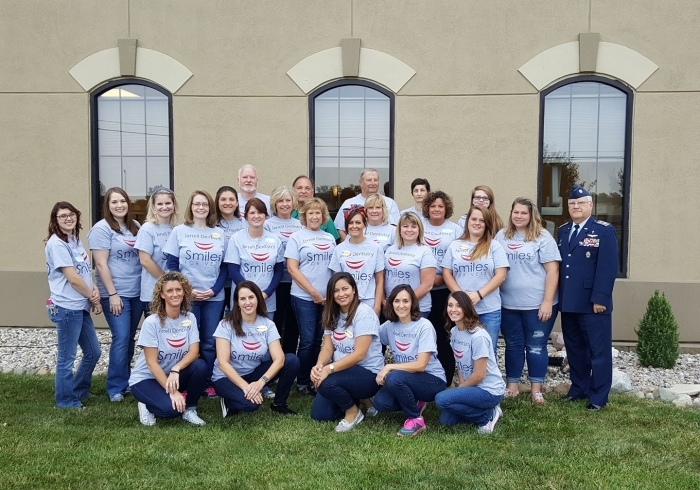 We are truly blessed to be able to provide services for our military patients and are thankful for all they do to support our country and keep us safe. Thank You. I had a bad experience at the dentist when I was a child, and I am embarrassed that I have a huge fear of the dentist. Do you sedate for dental procedures? First of all, there is no need to be embarrassed. Many adults have fears of the dentist. Let us assure you that our entire team is completely dedicated to putting all of our patients at ease and make them feel comfortable. We do offer a service that is a safe alternative to being put under completely. It is called oral conscious sedation (OCS) or sleep dentistry. With sleep dentistry, you are able to respond to requests but are in an extremely relaxed state, and the stress that you might feel about going to the dentist is alleviated. What can I do for dry mouth or burning mouth? Dry mouth is a serious problem that can affect your body in several ways. Most people with dry mouth get cavities very easily, cannot eat all foods, and sometimes have burning pain. Most dry mouth is caused for medications or a medical condition that causes dry mouth. First, always use a mild toothpaste that is SLS free. Second, never use any mouthwash that contains alcohol. Third, stay away from sugary mouth drops or candy. Please make an appointment to talk to us to review other treatments to help you. There are several methods available for whitening the teeth: in office, overnight or daily. Power whitening is done in our office. One session generally lasts one and a half to two hours, and you can read or relax during the treatment. For daily whitening, we make an impression of your teeth and create a mouthguard that fits your bite. Each day, you fill the mouthguard with a small amount of whitening gel and wear it 30 minutes to one hour during the day. The daily whitening process takes approximately two weeks. Other over-the-counter daily whitening products are available, but it is important to use any whitening product only under the supervision of a dentist. To achieve the whitening results you desire, the ADA recommends that you seek the professional advice of a dentist, including examination and diagnosis of the cause of tooth discoloration, before you begin any whitening program. What if I have a gap in my teeth, a chipped tooth or teeth that do not respond to normal whitening methods? Porcelain veneers are very thin pieces of porcelain that actually bond to the tooth. In fact, the porcelain bond to the tooth is nearly as strong as the natural enamel bond in teeth. Porcelain bonded to enamel is one of the most successful restorations available today in dentistry. What are signs and symptoms of gum disease? Bleeding, red, tender, swollen, puffy or itchy gums and gums that peel away from the teeth are signs of disease. Changes in bite or fit of a partial denture, constant bad breath or taste, loose shifting teeth or hot- and cold-sensitive teeth are also signs of gum disease. Genetics do influence the disease. Anyone can develop gum disease. We continuously check our patients for gum (periodontal) disease and will help prevent gum disease for our patients when possible. Can I get a dental implant here at Dr. Melissa Jarrell’s office or do I have to go to a surgeon? Why do I have to go to a specialist if I need a molar root canal or impacted tooth extraction? While Dr. Melissa performs many general dental procedures including root canal treatment and third molar extraction, there are a few procedures she prefers to send to a specialist to ensure the best treatment outcome for our patients. Consider it similar to seeing a cardiologist for a heart problem instead of your family physician. Does Dr. Jarrell have digital radiography (computer X-rays)? Yes. She feels they show much more detail than the traditional films. Digital X-ray machines also emit less radiation compared to the traditional film-based type. How much radiation does the patient receive from dental X-rays? The dose of one film is only 1/10th of 1% of your yearly radiation exposure from natural causes. I have a lot of old fillings (silver) in my mouth that have been there for a while. What are my options? Old silver fillings can leak over time, causing decay to re-enter the tooth. Not to mention they are unsightly. Options for silver filling replacement include direct composites (tooth-colored fillings) or porcelain inlays and onlays, all of which provide an esthetically appealing and healthy result. What is that black line I see around the gumline of my crowns (or other people’s crowns)? The black indicates that there is metal underneath the white porcelain. The black line you see around the crown was probably not there when the crown was placed. Over time, chronic inflammation of the gum tissue causes it to bleed easily and perhaps recede from the metal, exposing it. No longer is it necessary to have metal in crowns or that unattractive dark line. When indicated, Dr. Jarrell uses all porcelain crowns. Can I get a porcelain crown made in one day? Yes! Dr. Jarrell and Dr. Oliveira enjoy using the CEREC system to make beautiful custom natural colored crowns in less than an hour. No need for a temporary and no need to miss more work and have to come back two weeks later. “Our patients love getting their crowns placed without yucky impression material and having to wait. I really like how natural the crowns look and how strong and well-fitting the crowns are. This technology is amazing!” says Dr. Melissa Jarrell. OH NO, I BROKE my denture! Can your office repair my denture in one day? Yes! We always strive to provide the best service. Most denture repairs can be done in one day if the broken denture is brought to our office by 9 am.